Kootenai County cities and highway districts yesterday submitted a ballot proposal to the county clerk to give voters the chance to weigh in on a Proposed Vehicle Registration Fee at the polls this November. If passed, the fee would add $24 to the price of registering your vehicle each year for the next 20 years, to help fund road maintenance and improvements in Kootenai County. Here's a look at some frequently asked questions about the proposal and how it would affect you and me. How Accurate Is That Gas Pump? Do you really get what you pay for when you gas up? Well, State officials say gas pumps around Idaho are much more accurate than they were three years ago. Here's how accurate those pumps are. I've heard stories of malfunctioning gas pumps before. Have you ever been ripped off, that you know of, by a gas pump? Too bad they're too big for Lake Coeur d'Alene, maybe we could have gotten a screaming deal :) Four 80-year-old ferries pulled from service on Washington's Puget Sound didn't receive a single bid when listed on EBay last week. The minimum bid was $350,000 each. Still, a spokeswoman for the ferry system says there are some people interested in purchasing the boats. She says potential buyers have expressed an interest in buying all four at a lower, nondisclosed price. Spokane Transit Authority has recently started crunching the numbers with agencies in North Idaho (including Kootenai Metropolitan Planning Organization) to determine the feasibility of implementing public transit between Post Falls and Spokane. At a recent 'Public Transportation Roundtable,' a new committee formed by KMPO, the discussion was what kind of route to provide; a through route with a variety of stops or a direct commuter route from Post Falls straight to downtown Spokane with limited stops. The consensus was to provide a little of both. The talks are in the early stages so it will still be a while before you can use public transportation to travel between Spokane and North Idaho. In the meantime, here's a piece KXLY did on the situation yesterday. A possible cross-state bus link and full van pools: Here's what's happening in our area this week courtesy of the Spokesman-Review's 'Getting There' column. This blog is a pretty good resource for adventurers who want to tour the whole Centennial Trail in Idaho. I hope they can get people to comment on the blog and keep it fresh and lively. One post I found interesting was the link to the ICT website where you can get the ICT big picture and maps and stuff. Did you know that the Centennial Trail is 900 miles long? Anyway, this blog will be worth checking in on from time to time. The Panhandle Public Health Foundation (PPHF) believes quality of life starts with a physically, mentally and emotionally healthy population. That's why the foundation raises money to promote public health programs such as low-cost clinics, senior companionship and child abuse prevention in the five northern counties. Saturday, Aug. 16, is PPHF's second annual Pedalin' for Public Health bike ride on the Trail of the Coeur d'Alenes. The family event stretches from Plummer to Enaville and ranges from 15 to 43 scenic miles. Most importantly, it raises money for public health projects that improve life for everyone in the Panhandle. The ride starts anytime from 8:30 a.m. to 11 a.m. Registration costs $25 for adults and $5 for children. Adult registrations by Aug. 8 include a T-shirt. To register, visit www.pphf.net. PPHF was able to award $3,000 in public health grants this year thanks in part to enthusiastic participation last year in Pedalin' for Public Health. Don't miss out on a perfect family outing that has the potential to benefit thousands. Would You Support A 'Bike There' Function On Google? Google recently partnered on an initiative that measured how walkable neighborhoods are. Since then, a lot of people have been saying how cool it would be if they did the same with bike routes and facilities. And some people aren't waiting for Google to think it up themselves, they've started a petition to ask Google to add a 'Bike There' function to their mapping capabilities. The Metro Spokane blog has more information and a link to the petition. Construction begins Monday to straighten the curves on Kathleen Avenue from Player Drive to St. Michelle. Safety concerns prompted the straightening of the roadway, as more and more bicyclists and outdoor enthusiasts began using Prairie Trail. A pedestrian-activated crossing light will be installed where Prairie Trail crosses Kathleen Avenue. Traffic will be congested in this area with slowdowns and traffic pattern shifts. The work will take from six to eight weeks, finishing near the start of the new school season. Is this a good problem to have? It seems that all of the bicycle traffic, and disregard for the rules of the road, in Portland has drawn the attention of law enforcement. They have had emphasis patrols out for the past couple of days to "re-educate" all modes of commuters -- but primarily bicyclists on the traffic rules. Most violators are receiving warnings, but a couple of citations have been issued. One has to believe that this emphasis was sparked in part by recent road rage incidents between motorists and bicyclists in Portland. You can read the full story here. Okay, I admit it. When I ride my bike, I rarely follow the same rules I would ordinarily follow in my car. I can see where that could become problematic, so I will vow to change my ways. How about you...do you always follow the proper rules while bicycling? UPDATE: Huckleberries Online linked our post here to a discussion over there. Also, a southern Idaho poster who calls himself Sisyphus provided this link to Idaho's bicycling laws. It's pretty interesting stuff. Do We Need To Give Thieves Ideas On How To Steal More Efficiently? Last week I posted a link to a map of the Centennial Trail through the Coeur d'Alene area, so it's only fair this week that Trail of the Coeur d'Alenes gets a little love. So here's a link to the Trail's website. Click 'Our Map' to see the map of the trail, or there's a really cool feature you can check out if you have Google Earth called 'Fly It Before You Ride It.' Have fun! KMPO has just completed a draft Transportation Improvement Program (TIP) for 2009 - 2013 and it's now ready for you to review and comment on it. The TIP is a funding program document that lists federally and non-federally funded transportation improvements proposed by various jurisdictions. It identifies regionally significant transportation projects that jurisdictions and agencies plan to undertake during the upcoming five years. You can review the TIP on the KMPO website by clicking here. There are also instructions there on how to submit comments. Go crazy, we want to hear what you have to say. Idaho law enforcement officers are on the lookout this week for aggressive drivers as part of an operation funded by the state Transportation Department. The Spokesman-Review reports that officers will be ticketing drivers for speeding, tailgating, running stop signs and illegal passing. Since the average price of gasoline hit about $3.25 a gallon early this year, bike sales have skyrocketed. But more bikes mean more accidents. This MSNBC article tells how authorities across the country say they are seeing a sharp rise in the number of accidents involving bicyclists. If you haven't checked the KMPO site lately, the updated 'alternatives' for improvements to US95 have recently been posted. KMPO is teaming up with David Evans and Associates to conduct a 'US95 Access Management Study' to improve the flow of traffic on US95 and address growing safety concerns at unsignalized intersections, while still providing access to the highway and businesses along the highway. The primary goal of the study is to evaluate low-cost strategies to manage and balance access to US95 from adjacent streets. The intent is to identify measures which can be implemented within the next 5 years. For more information on the study and to view the alternatives under consideration, or to express your opinion on which alternative should be utilized, go to the project web page. Are there more bikes on the road, or does it just seem that way? The Spokesman Review had an interesting editorial today -- even if it is Spokanecentric. (check it out here). They are calling on agencies that have jurisdiction over roads to take increased bicycling into account in their planning efforts. We at KMPO would agree with the SR's editorial, but it's worth pointing out that many jurisdictions are, in fact, already doing this. Just look at all the development activity around Riverstone and west along the river toward Post Falls. 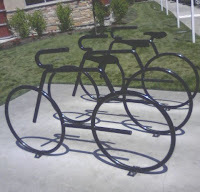 All of that development includes a vast array of trails for bikes and pedestrians. 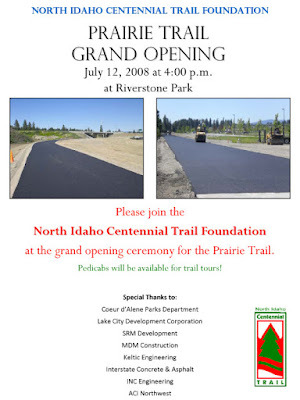 Not to mention the brand new and beautiful Prairie Trail extension of the Centennial Trail stretches just over 5 miles from Riverstone northwest across the prairie to Huetter Road. Likewise, in Spokane County many of the larger jurisdictions have actively supported the "SmartRoutes" project, and they have also started developing and updating their bicycle master plans. The City of Spokane is also trying to figure out how to incorporate a bicycle coordinator position into its planning and engineering departments. The STA bicycle rack problem that is mentioned in the editorial is a tough one, but I wonder if the problem could be solved by having the buses pull trailers for the bikes. (Just a thought). I also heard at one time City Link was looking at new buses that could handle more bicycles by allowing the riders to carry them on board. I don't know if they are actually pursuing that, but I'll check into it and let you know. In the meantime: How would you purpose to fix the shortage of bike rack space on the City Link buses? The Idaho Transportation Department says an additional $240 million is needed each year to combat rising construction prices, deteriorating roads and highways and an expected drop in federal funding. But some citizens who attended the meeting aren't happy about a proposed funding increase. Here's the story from the CDA Press. KMPO 'Special Correspondent' Jeff Selle spent the day at the meeting yesterday and will (hopefully) post his take on it later today. Bad news for those of us who fly in and out of Spokane International Airport, it's going to offer fewer flights in the near future. Express Jet is discontinuing service at the begining of September and Horizon plans to reduce service over the next year. The problem isn't that people can't afford to fly anymore because of the economy. Even the full planes are losing money because the cost of fuel isn't being covered by airfare costs. Don't get your hopes up, but oil prices settled sharply lower for the second day in a row today, leaving crude more than $10 cheaper in two days of frenzied trading. analysts are unsure whether the drop represents a long-term shift in sentiment or simply a brief correction to crude’s monthslong bull run. At a special Council Meeting last night, the Harrison City Council reversed its' position and approved a resolution that will give Kootenai County voters a chance to weigh in on a proposed vehicle registration fee increase. At its' last meeting, the Council voted against the resolution. The Harrison Council approval was needed to get the resolution on the ballot, as an election to increase registration fees must be approved by either a two-thirds majority vote of county commissioners or by written requests from the governing boards of each local highway jurisdiction. If approved by voters, the $24 rise in vehicle registration for 20 years will help fund road and highway maintenance in Kootenai County. So what comes next for the proposed fee? We (meaning KMPO) will start immediately working to educate the public on the vehicle registration fee, then voters will get their chance to voice their opinion when it goes on the ballot for the general election in November. A public meeting is scheduled for tomorrow night from 4-7 p.m. at the Best Western Coeur d'Alene Inn for members of the public to give Governor Otter and other transportation officials input on how best to pay for repairing, maintaining and improving the states crumbling roads and bridges. Escalating highway construction costs, declining revenue and unprecedented demand on Idahos transportation system have converged to create an annual revenue shortfall estimated at $240 million. The three-hour meeting will be divided into two 90-minute segments, beginning at 4:15p.m. and 5:45 p.m. The public is encouraged to attend either session and share written comments. Suggestions also can be mailed to the Idaho Transportation Department, P.O. Box 7129, Boise, ID, 83707-1129. It's supposed to be 90 degrees outside today and I'm stuck in a cubicle! What to do, what to do? I know, I'll plan for the next day when I can actually be outside. A bike ride along the Centennial Trail in North Idaho sounds great. But where do I park, what if I run out of water, and what if I have to, you know, use the facilities? This map on the North Idaho Centennial Trail website answers all those questions, plus shows some great parks to check out along the way. Is variable pricing knocking at our door? As the federal highway trust fund fizzles out at the national level, and the state coffers for transportation are tapped out, various new revenue sources to fund transportation infrastructure are being considered and tested out. It appears that one of the most viable sources for transportation is going to be some form tolling the users of the system. Of course, traditional tolling is always going to work due to economies of scale and for other geographic reasons. But it does look like we are headed for some form of a pay-as-you-go type of revenue stream. Take Seattle for instance, the city is pilot testing a new concept called congestion pricing on the 520 bridge project. Seattle is one of five major metropolitan areas in the country to test the concept. In essence, congestion pricing is way to manage demand on the transportation network by charging higher tolls during the peak driving times and reduced tolls during the non-peak hours. The goal is to incentivize commuters to use public transportation, ride a bike, or adjust their driving times (if possible) to reduce congestion during the traditional "rush hours." The concept is really gaining traction in the major metropolitan areas. Just last week, the city of Portland conditionally approved a $4.2 billion bridge expansion over the Columbia River on U.S. I-5, and they plan to use variable tolls, or congestion pricing, to pay for the project. Read the whole story here. Governor Otter and his staff will be in Coeur d'Alene this week to discuss with the public how they would prefer to pay for transportation infrastructure into the future. 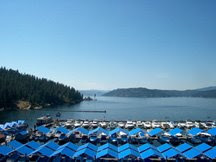 The meeting will be from 4-7 p.m. Wednesday at the Best Western Coeur d'Alene Inn. A brief introduction to the funding challenges will be presented at 4:15 p.m., 5:15 p.m. and 6:15 p.m. Otter will lead the presentation at 4:15 p.m. For more details on this meeting click here. Question: Do you think some form of congestion pricing would work in our region? If so, how would it work? Governor Otter and the Idaho Transportation Department will be in Coeur d'Alene this Wednesday for a meeting called 'Building Roads, Bridges, Building Consensus' to get input from the public on how best to pay for repairing, maintaining and improving the state's crumbling roads and bridges. The 4-7 p.m. public meeting is at the Best Western Coeur d'Alene Inn. An introduction to the funding challenges will be presented at 4:15 p.m., 5:15 p.m. and 6:15 p.m. Gov. Otter will lead the presentation at 4:15 p.m. In addition to the public meeting, the governor's staff and transportation department officials will meet during the day with area legislators and other local elected officials, business and industry leaders and local highway district representatives. Escalating highway construction costs, declining revenue and unprecedented demand on Idaho's transportation system have converged to create an annual revenue shortfall estimated at $240 million. One in five miles of state highway is considered to be in poor condition by engineering standards, and nearly half of the bridges on the state system are approaching their life expectancy of 50 years. Okay, with camping season upon us, we need to be careful out there. COEUR d'ALENE -- With skyrocketing fuel costs, North Idaho residents are turning to Citylink and leaving their cars and gas-guzzling SUVs parked at home. There were 33,311 individual passengers riding Citylink buses in June, up from 18,089 people riding the bus in June 2007. "We've nearly doubled ridership and it's continuing to climb," said Alan Eirls, Citylink's transportation manager. "The request for growth is continuous. We're limited by money and equipment." Citylink, a partnership between the Coeur d'Alene Tribe, the state of Idaho, Kootenai County, and the Kootenai Metropolitan Planning Organization, offers free public transportation to North Idaho residents. 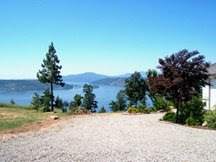 Check out the rest of the story at the Coeur d'Alene Press website. Have you taken a ride on Citylink yet? if not, what would it take to get you on board, so to speak? Transportation funding was a major focus of the 2008 legislative session and it should be an even greater issue next year, District 4 Representative Marge Chadderdon wrote in a special column that was published today in the Coeur d'Alene Press. Gov. Otter and Idaho transportation officials say we need $240 million to maintain and improve Idaho highways and legislators are at odds over how to pay for improvements. That's where you come in. As your state representative, I would like your opinions and guidance on the road funding issue. The governor's office and the Idaho Transportation Board have scheduled a conference in Coeur d'Alene on July 16 at the Best Western Inn, 506 West Appleway Ave., to talk about Idaho's transportation needs and various funding options. I highly encourage you to take part in this important conference. The public meeting will be 4-7 p.m. Separate meetings are planned with mayors and city council members, county commissioners and highway district officials, chamber of commerce and business leaders and legislators. Similar conferences are planned throughout Idaho during this month and early August. Click here for the whole column. After reading the options she has provided, how would you propose to make up the shortfall? The River City Rod Run is set to start Friday evening in Post Falls. According to this Coeur d'Alene Press story, the festivities begin at 6 p.m. Friday and last until midnight and resume at 8 a.m. saturday until midnight. There is a schedule of the various events at the bottom of the story we linked above. This is a good story about the tensions (or road rage) that exist between bicyclists and drivers. First of all, it's a bicycle story set in Portland, so you know it's going to be a good one, but also the driver in this story is a longtime bicycle advocate. What's Next For Proposed Vehicle Registration Fee? The Harrison City Council has rejected a resolution that would give Kootenai County voters a chance to weigh in on a proposed vehicle registration fee increase. The fee -- a $24 rise in vehicle registration for 20 years -- would help fund much-needed additional road and highway maintenance in Kootenai County. But unless the Harrison Council reverses its decision, registration fees will likely remain unchanged, as an election to increase registration fees must be approved by either a two-thirds majority vote of county commissioners or by written requests from the governing boards of each local highway jurisdiction. So what comes next for the proposed fee? It's back to the Council. KMPO Transportation Planning Engineer Carole Richardson yesterday spoke with Harrison Mayor Josephine Prophet, who said the City Council may be willing to consider the issue again at its' next meeting on August 5. There's also the possibility that County Commissioners could agree to place the issue on the ballot, without the approval of all the cities involved. More Parking Needed For Motorcycles, Scooters, Bikes? With the increase in gas prices, it's inevitable that more parking for alternate forms of transportation is going to be required. Huckleberries' question is: How do you think the current escalating gas prices will ultimately play out, in terms of different types of travel and even parking space? If you think you're saving money at some area gas stations that still have prices below $4 a gallon, think again and read the fine print. The Coeur d'Alene Press says some stations are charging us more for using debit and credit cards! We've all read the articles on 'hypermilers,' people who use extreme methods to increase gas mileage; such as coasting with your engine off, drafting behind big rigs, and driving much slower than the speed limit. Idaho State Police and driving experts now say what they're doing is not only dangerous, but could be illegal too. Here's the story. Have you ever tried any of these techniques to save gas? If so, did it work? Mayor Sandi Bloem will put Carole and Sean on the hotseat with a variety of questions regarding the Study, and they will give the most updated information on the study. The segment starts airing on Channel 19 on July 15. Here's a link to more information on Channel 19 and a program guide. And here's a link to more info on the US95 Access Study. Car-Free Day- A Possibility In North Idaho? For three Saturdays in August, a route linking Brooklyn Bridge in the south and the Upper East Side and Central Park in the north will be cleared of all traffic to be freed for use by cyclists and walkers. Do you think a 'car free' day would fly in Coeur d'Alene or Post Falls or anywhere else in our area? A friendly reminder that if you're travelling over the holiday weekend, you should check the Idaho 511 website before hitting the road so you know what areas to avoid due to construction. The site also shows real-time accident information and weather and traffic problems.Here's the link to see how your route is looking. The Interstate 90 westbound on- and off-ramps at Exit 7 (Idaho 41 Interchange) will be closed for paving operations Wednesday (July 2) from 7 p.m. to 5:30 a.m. as part of a project to improve I-90 from the Idaho-Washington state line through Coeur d'Alene. Contractors are paving the interchange ramps. Work on the project will take place at night to minimize impacts to travelers. Traffic will be reduced to one lane through the work zone. The speed limit is reduced to 55 mph. Motorists should plan to use an alternate route. Additional access from the freeway is located at the Seltice Boulevard and Spokane Street exits. If gas prices have forced you to cut back on driving or you started riding your bike to work, you may be able to get your automobile insurance reduced, according to Idaho's Insurance Commissioner. He said that if you commute to work using a different mode of transportation, most insurance companies will reclassify your car to a "pleasure" vehicle. Check out the story here. While this story is pretty Washington-centric, I found the excerpt below to be pretty interesting. Jim Addis, general manager of Coeur d'Alene's Tom Addis Dodge and Lake City Ford Lincoln Mercury, said he'll stock only cars that meet California standards. "It doesn't cost me any more," he said, "and then our customers can't have any conceivable problem." I know I am beginning the sound like a broken record, but again...if auto dealers in Kootenai County are going to start selling these cleaner burning cars, why are we starting a vehicle emissions inspection and maintenance program? This was as puzzling as could be. Just a week after the Idaho Transportation Board received a report on the Dover Bridge on Highway 2 in North Idaho, declared the 71-year-old bridge safe but still sorely in need of replacement, and bemoaned the fact that there’s no money to do it – the project isn’t in the ITD’s five-year plan at this point – I received a press release from the state DEQ calling for public comments on permits for wetlands filling “to construct a replacement bridge on U.S. Highway 2 near Dover.” Comments are due by July 25. Read the whole story here. Coeur d'Alene's City Hall will be closed this Friday for the Fourth of July holiday. Other city offices and facilities will be closed as well. Emergency calls for Police, Fire, and Streets can be made by dialing 9-1-1. City Hall and other city facilities will re-open Monday, July 7th at 8:00 a.m. Cheers to the City of Post Falls for taking the initiative to offer free shuttle service to the 4th of July festivities in Q'emiln Park. The celebration includes bands and other entertainment, games, and fireworks. The events start at 1 p.m. and the shuttle service runs every 15 minutes between 5 p.m. and 11:30 p.m. Current stops include Q'emiln Park, Black Bay (3rd street parking lot) the Trading Company and 4th street and Spokane Street. For more information check out the Post Falls website .